Battle of the Horns! The Disney Dream vs. The Disney Fantasy! It is a very chilly day on the East Coast and all of the weather forecasters are warning of a day full of "yuck" tomorrow in the form of a wintery mix. I decided a mental escape was in order so I fired up the computer and decided to "visit" Castaway Cay through the photos I took last winter and spring. While doing so, I came across a fun video that I grabbed with my digital camera. As we left the Fantasy to spend the day on Castaway Cay, the Dream did a sail by - a "once in a lifetime" occurrence we were told! The ships put on a show in the form of a horn battle. So pretend it is a beautiful, warm, sunny day with sand between your toes and enjoy! A travel agent specializing in Disney has knowledge and experience. Not only do specialists have a love of Disney, and lots of experience, they also have taken tests to "earn their ears." (Literally! When I completed the College of Disney Knowledge Disney sent me a set of ears complete with Mortar Board and Tassel.) Specialists also work hard to keep their knowledge current. I often get calls from overwhelmed parents trying to plan the perfect Disney cruise for their families. Let's face it - there are a lot of moving parts to a Disney vacation, from transportation, to choosing from a multitude of hotels before or after your stay, to selecting a stateroom, to planning excursions. And that is not even counting a possible add- on trip to Disney World and all of those details. It is a lot to figure out! I like to get to know my families a little bit, figure out the budget, and help them make the most out of their time and budget. A travel agent knows what the discounts are and where to find them. I have worked with clients who were very surprised when my quote was substantially less than the exact same vacation they priced out themselves. To be fair, Disney is not very generous with their cruise discounts, but if they are there, we will find them! Discounts can be much bigger factor if you are considering adding on a trip to Disney World. A travel agent can save you money in other ways. Personally, I try to spend my clients' money like I would spend my own. Sometimes spending a little extra gives you a lot, sometimes spending a lot extra gives you very little. I try to let my clients know where they should splurge and where they should cut corners. I have on many occasions tried to talk clients out of more expensive vacation packages. While it is absolutely true that the more you buy the more commission I may make, I am much more concerned that at the end of your vacation, you feel like you got your money's worth. I would rather make less and have you trust me than make more and have you feel like you overspent. You will be much more likely to share my name with a friend, and I will sleep better at night. A travel agent can help you sort it all out. From when to cruise to get the best rates to sorting out the differences between the 25 different room categories, we have you covered! We can help you avoid the room over the night club or high traffic hallways. Concerned about seasickness? You can choose a stateroom to help minimize the effects of the motion of the ship. A travel agent can help you strike a balance between budget and amenities, while keeping all of the other factors in mind. A travel agent is a great sounding board! If you have ever called Disney directly, and asked whether you should do A or B. You will likely hear something like "Oh, they are both fabulous choices." Well, I have opinions that I will freely offer! More than that, I try to tell you why I like something or not or why I think you would like something, or not. The final decision is up to you, but I want to make sure you have the information you need to make the best decisions for your family. To be fair, using a travel agent might not be for everyone. If you are an ultra type A personality in terms of vacation planning (ahem - like me) it can be a little hard to let go of the control. Not that a travel agent is going to "control" your entire vacation! But once a travel agent books your reservation, they have to make changes to the reservation. So if you decide at 9:45pm that you want to change your stateroom, then you will need to contact your travel agent to do it instead of calling Disney directly. Also, you should have a good feeling about your agent. For me, my relationship with my client is all about trust. I want my clients to know they can trust me to do the best I can for them. I work hard to find the best deal for my clients, whether it be finding discounts or making honest recommendations to control costs. In the long run, I know that working harder to reduce my commission is good for my client, good for my business and good for my conscience. If you do not get a good feeling after your first conversation with your agent, just thank him or her and move on. 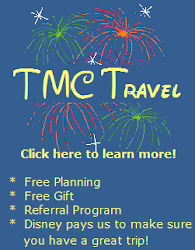 We offer free gifts to all of our clients who book a 3 or more night Disney Cruise. We have a lot of "goodies" that can make your trip a little more special and fun. We help with dining reservations and recommendations for excursions. The Disney Cruise Line website makes it very easy to you to make (or change!) your plans. We are happy to work with you to make the most out of your excursions and your time on board. Adding on a Disney World Vacation? We keep you organized! We have some great tip cards that are personalized for your trip. Sized to fit in your back pocket or park bag, we will make sure you know park hours, parade times, fireworks times, magic hours, and the dining reservations we made for you for each day of your trip! We also have other great tip cards that cover everything from the best snacks in "the World" to how to enjoy Epcot's World Showcase with children. To be fair, I guess I should give you a reason not to use TMC Travel for your next vacation...or at least a reason not to use me. Using me makes you a Disney-enabler. Each trip you book with me only furthers my Disney addiction. If you can live with that, give me a call or send me an email and let me help you plan your next vacation! One thing to keep in mind for your cruise budget are gratuities. It is expected that you will receive excellent service you are sure to while on your Disney cruise and you will want to reward those individuals who helped provide that! There are few things you should know about gratuities. First, gratuities are always at your discretion. While Disney does have some suggestions you are in control of how much you tip. Some gratuities will added as you go. This includes spa services, room service and bar services. Others, like your stateroom host and dining servers will be given at the end of your cruise. You have the option to prepay your gratuities for you Restaurant Server, Restaurant Assistant Server, Head Server and Stateroom Host. You can prepay them up to 3 days before your sailing. If you do not opt to prepay your gratuities Disney will automatically charge the suggested amounts to your stateroom on embarkation day. You can make modifications to these amounts if you like and you will receive a letter in your stateroom explaining this. You will receive gratuity tickets and envelopes to be handed out on the last night of your voyage with the gratuity amounts on them. So, what are the suggested amounts? Disney recommends the following PER PERSON: Restaurant Server: $4/night, Restaurant Assistant Server: $3/night, Head Server: $1/night and Stateroom host: $4/night. So that's about $12 per per night/ per person. There are some auto-gratuities for bar services while on board or at Castaway Cay. If you get a drink at any of the bars you will automatically be charged 15% gratuity. Tipping for spa services is at your discretion but the standard amount is 15 - 20%. As always, here at The Mouse Connection we are here to help you navigate the waters and answer any questions you have about gratuities or anything Disney cruise related! With a little advance planning and some help from Guest Services you can make it happen! Before our cruise I was cruising Etsy and found some great work from a vendor called Stitches N' Bows. You can find a link to her Facebook page here. She has a ton of Disney inspired pillowcases, fish extenders, clothing, and other fun stuff. After looking through some photos of her work, I knew exactly what I wanted. I contacted her via Etsy with what I was looking for and it arrived in the mail a few weeks later just as I described. I discretely packed the pillowcases in our luggage and we headed off for Port Canaveral. While my kids were enjoying some Super Sloppy Science in the kids club, I grabbed my pillowcases and popped over to guest services. I asked if they could arrange for the characters to sign the pillowcases for me. They asked if I wanted "Princesses" or the "Classic Characters". I asked if they could do "all available characters." I left the cases along with a sharpie in a gallon size Ziploc bag that I bought from home. They promised that the signed cases would be returned on our last night. When we returned from dinner our last night, my girls were THRILLED to find the treasure that was waiting for them. It was the icing on the most fantastic cake! So for your next cruise, consider bringing a photo mat, t-shirt, pillowcase, hat or some other special item for the characters to sign. Other than the cost of the item, the service is free, fun, and a spectacular keepsake of your Disney Cruise! One of the most fun things, especially for kids, on the Disney cruise ships is the character interactions. The character fun begins at Port when Captain Mickey and Minnie often make appearances in the terminal while guests are waiting to board. They will also lead the way onto the ship with the "First Family" to get boarding started! And, while you are eating lunch special friends might make their way into the dining room to welcome everyone aboard. Mickey, Minnie and the whole gang will be at the Sail Away party to wave bye-bye to port and get your vacation started. After that there will be lots of times for photographs and autographs with characters all around the ship. Your daily navigator has a special section for character appearances. There is also a listing near guest services with all the character appearances for the day. The locations of the character appearances are all around the ship from the Lobby to the lounge to the Pool Deck. Characters also find their way to Castaway Cay and make appearances all around the island. Some of the characters we saw on our last cruise included: Mickey & Minnie (in several different outfits), Chip & Dale, Goofy, Pluto, Snow White, Donald & Daisy, Tiana, Ariel, Cinderella, Sleeping Beauty, Lilo, Peter Pan, Captain Hook, Tinkerbell and Jack Sparrow. Disney Cruise Line has photographers available at most of the character meet & greets as well. Similar to Disney World's Photopass you give the photographer your room key, they scan it and then your pictures will be posted at Shutters for your viewing pleasure. You are also welcome to take your own pictures. Characters will also sign autograph books. On our last cruise they would not use a Sharpie though so be sure to bring a different pen. If you are on a 7 night cruise or longer you will have a character breakfast scheduled. You will find your assigned day and time in your stateroom upon check in. Your dining team will serve you and character friends will come to each table. The character interactions are just another thing that set Disney Cruise Line apart from all other cruises! All week we've been talking about the little slice of paradise that is Castaway Cay, Disney's private island. We've given you an overview of the island, talked about what to do while you are there, given you the 411 on food and shopping and talked about the beaches. Today I thought I'd give you some tips & tricks to make the most of your time on the island. No need to bring your own beach towels - there are cast members handing out towels as soon as you debark the ship. It's OK to ask for more than one! All you need to get back on board is your Key to the World Card. The first tram stop is located close to the ship. Jump on there if you want to head to Pelican's Plunge or Serenity Bay. The first family beach area is a short walk from the tram stop. There are some photo ops along this walk. There are strollers, wagons and wheelchairs available at the first tram stop which is also the end of the walkway to the family beach. They are complimentary but on a first come, first serve basis. They are all equipped to roll on the sand! Perfect if you have a little one or a guest that needs some special attention. If you forget your sand toys no worries..there are some available for purchase. They range in price from $5 to $20. Bring a water bottle and fill it up at the beverage station before you leave the ship. Bottled water is available on the island but it's pretty pricey. Also, the cups at the beverage station on the island don't have lids. The Oceaneer Club and Lab relocate to the island at Scuttle's Cove. Kids will enjoy the planned activities there! Wave phones work on the island so don't forget to grab yours! Water shoes are not a bad idea. The sand is beautiful but can be a little rocky. Tender feet might feel a little uncomfortable walking on it. If you find treasures at the shops cast members will deliver them right to your stateroom so you don't have to lug them around all day. The bike path has a great viewing spot halfway around the main loop. Be sure to have your camera! It can get very hot around the island. There are water coolers in various locations around the island. Relax and have fun! You're on a magical vacation! !